The PRO Riser plate provides linear motion along each side of your machine, and provides a stout connection to your Gantry. This listing is for a single gantry riser assembly -- two are required for most machines. This PRO assembly offers excellent machine rigidity and stiffness for high speeds and accurate cuts. The latest riser plate design is made from 3/8" powder coated steel, and features holes to attach to the included vertical piece of 8080 (40mm series) extrusion. The plate is drilled and tapped to accept 4 V bearings -- 2 located on concentric bushings at the top of the plate, and 2 along the bottom which can be independently adjusted using our V Roller Cam System. 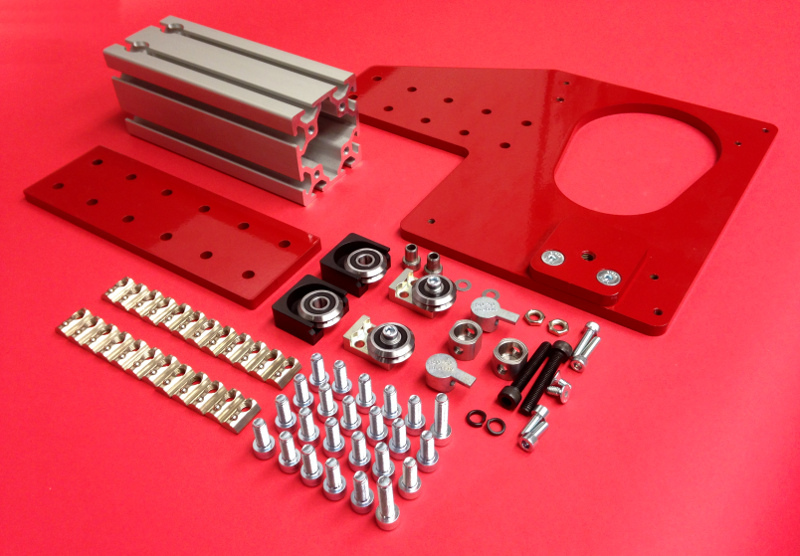 The vertical 8080 extrusion attaches to the machine gantry using both anchor fasteners and another 3/8" steel joining plate, included in the assembly for a rugged, square, and extremely stiff connection. With an included bracket for attaching a PRO Rack and Pinion System, this Riser is ready to take your Gantry to new speeds. (12) Roll-in t-nuts and M8 x 20mm socket head cap screws for use with joining plate. (2) Roll-in t-nuts and 20mm anchor fasteners for direct connection of 8080 extrusion to gantry extrusion. This product was added to our catalog on May 24, 2013.